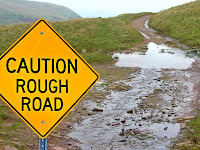 Wouldn’t it be great if God placed little signs along our life road to let us know when trouble was on the way? This would give us the opportunity to slow down, take a different route or on some days just not get out at all. The truth is that in reality there is always rough road ahead. Life is hard and there is just no getting around that fact. My lack of blogging these last few months is due in many ways to a season of roughness recently. I would be less than honest if I did not admit that it has been a challenging time in many ways. The loss of my mother law, family pet, a job responsibility change and few other things have all combined at once to lead me back to a white flag time of life.